It began with just another box of old black-and-white photographs being sorted during a visit to my mother in Melbourne, Australia. But there was one family group photo that stood out because I had never seen it before, nor could I identify one of the women in it. My mother was dismissive. "Oh, that's just Aunty Florrie," she said, "she wasn't talked about much." My mother's reaction to the photograph intrigued me. 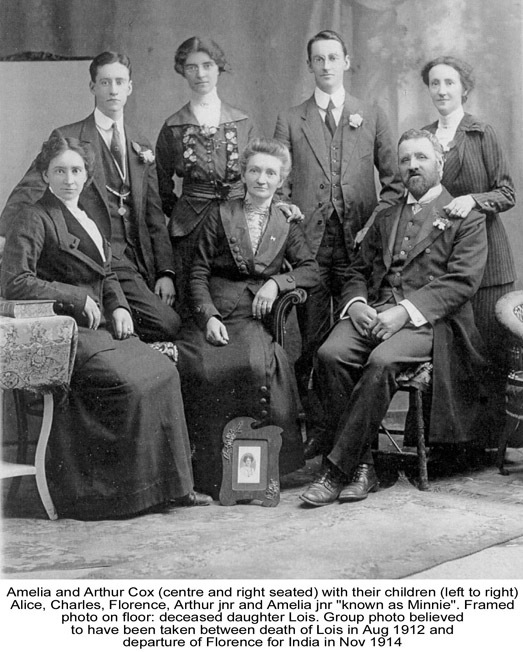 Why was Aunty Florrie the only member of my extended Cox family I had not heard of before? I pressed my mother to explain. Bit by bit I extracted the basic facts that Florence "Florrie" Cox had been married to a Baptist missionary in East Bengal (now Bangladesh), and that there was "another woman" whom her husband later married. There had been a "terrible scandal" when it happened around the time of the First World War. My mother's revelations seemed to amount to no more than a small sidebar story for the family history. I was not to know that it would lead me onto a late-life career change. Having left the BBC in 1996, I had been doing the usual things for a retired corporation manager: teaching, consultancies and writing occasional newspaper articles. But that all began to change as I dug deeper into Florrie Cox's astonishing story. The more I discovered, the more it became clear that what happened to my great aunt deserved a wider audience than the family history. My wife, Rosemary, and I were telling friends over dinner what had been uncovered about Florrie, when Rosemary suddenly declared "You know, this would make a great film!" I had to agree. I was about to leave for Australia, where I was born and grew up, so took the opportunity to sound out the national and Victorian State government film agencies about the movie idea. The people at Screen Australia, as the Australian Film Commission is now known, were polite when I met them in Sydney, but not enthusiastic. However, the reaction was different when I pitched the idea to Roslyn Walker, then Script Development Editor for Film Victoria in Melbourne. She thought it could make a wonderful film and that we should keep in touch as the project developed. It soon became clear there were two major problems: 1) I had yet to establish why there had been such a deep scandal, and 2) although I had spent a total of six years in television news, I was clueless about writing a screenplay. 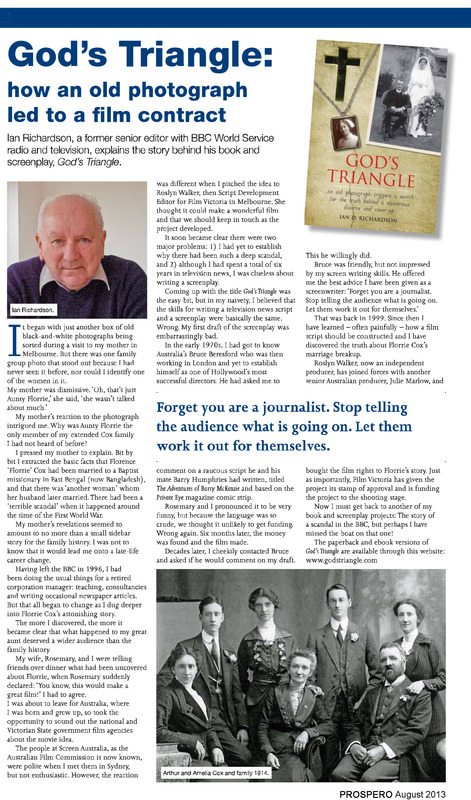 Coming up with the title God's Triangle was the easy bit, but in my naivety, I believed that the skills for writing a television news script and a screenplay were basically the same. Wrong. My first draft of the screenplay was embarrassingly bad. In the early 1970s, I had got to know Australia's Bruce Beresford who was then working in London and yet to establish himself as one of Hollywood's most successful directors. He had asked me to comment on a raucous script he and his mate Barry Humphries had written, titled The Adventures of Barry McKenzie and based on the Private Eye magazine comic strip. Rosemary and I pronounced it to be very funny, but because the language was so crude, we thought it unlikely to get funding. Wrong again. Six months later, the money was found and the film made. Decades later, I cheekily contacted Bruce and asked if he would comment on my draft. This he willingly did. Bruce was friendly, but not impressed by my screen writing skills. He offered me the best advice I have been given as a screenwriter: "Forget you are a journalist. Stop telling the audience what is going on. Let them work it out for themselves." That was back in 1999. Since then I have learned - often painfully - how a film script should be constructed and I have discovered the truth about Florrie Cox's marriage breakup. Roslyn Walker, now an independent producer, has joined forces with another senior Australian producer, Julie Marlow, and bought the film rights to Florrie's story. Just as importantly, Film Victoria has given the project its stamp of approval and is funding the project to the shooting stage. Now I must get back to another of my book and screenplay projects: The story of a scandal in the BBC, but perhaps I have missed the boat on that one!